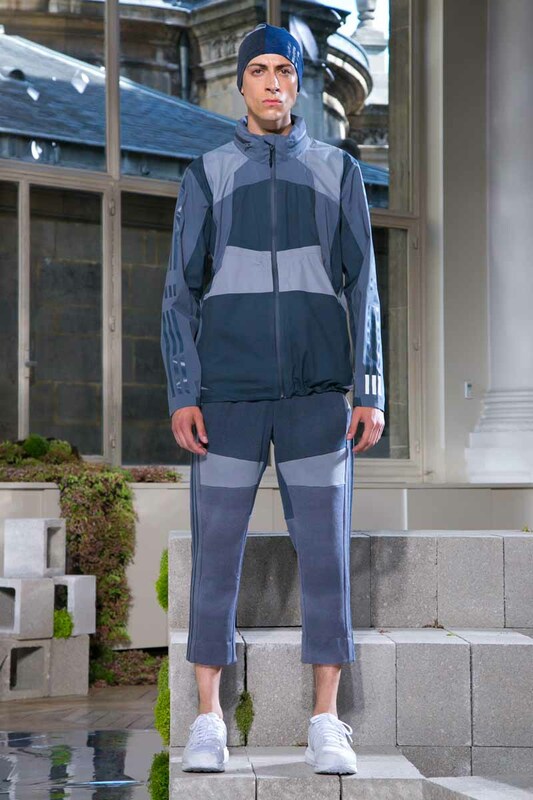 For Spring Summer 2016, innovative Japanese fashion brand White Mountaineering and adidas Originals expanded on their ongoing footwear collaboration by launching an apparel co-collection, on June 27, 2015 as part of the SS16 Men’s Fashion Week. Having partnered with adidas Originals on his SS15 and FW15 trainers, White Mountaineering founder and creative director, Yosuke Aizawa, unveiled the reflective capsule collection in a striking atrium space alongside Aizawa’s main line. Known for his technical approach to men’s fashion, Aizawa fused adidas’ utilitarian and progressive design language with his own sartorial philosophy and premium aesthetic. The result is a collection of 26 apparel pieces – a high-end mixture of focused jackets, shirts, shorts, cardigans, leggings and trainers – all with an exclusive version of the characteristic adidas three-stripe logo on the left cuff. The colour palette is minimal yet strong, mainly tonal shades of blue and grey, allowing the technical performance fabrics to be the focal point. Many of the styles and silhouettes originate from the adidas archives, such as the classic windbreaker jacket, but all garments have been reinterpreted and updated by White Mountaineering. As such, Aizawa’s highly functional fabrication and advanced cuts seamlessly merge with adidas’ fundamental idea of urban utility. Completing the collection is a series of footwear comprised of 10 pieces, centered around five key adidas styles: BW Army, Supergrip, ZX 500 HI, Formel 1 and Energy Boost, which makes its debut in the adidas Originals by White Mountaineering collection for SS16.